"I'd be shooting someone who hasn't done anything yet." Professor Wells put his hand on my shoulder. "Such is the dilemma of time travel, Ted. A world where reaction comes before action. Where you as the chrononaut knows what the future will be like because you've lived it, even if it hasn't happened yet." If you could go back in time and change the course of history, would you do it? Even if you could never be sure what the change would lead to? Can any of us really foresee the impact our actions have on history and the future? 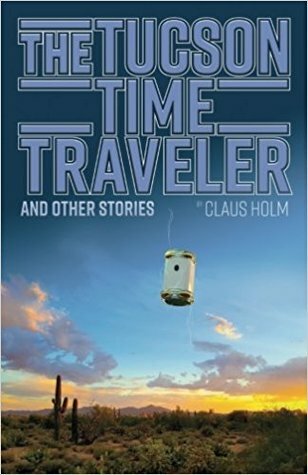 Through ten independent stories, Claus Holm explores the world of time travel, dimensional changes, and new technology. He shows us a world where Germany won World War II, introduces us to people who can cast minds from the future to the past, and takes us to a future where an earthquake has destroyed our civilization beyond repair. Each story treats the question of how people deal with challenges that change their view of life. It's funny - I'm usually not a big fan of short stories. Unless I'm already familiar with the universe, it seems like too much investment for too small an output. Which means that as a rule, I tend to stay away from short story collections. Claus Holm is one of the few exceptions, and with this short story collection he has published his best works yet. "The Tuscon Time-Traveler" is a collection of 10 short stories, all involving time-travel in some way or the other. I'll state my bias up front - as a rule I love stories involving time-travel (as long as it's done well), so I knew ahead of time that this would probably be right up my wheelhouse, and I was right. Of course with short story collections there will always be some that you love and some you care less for, and that was also the case here. My two absolute favourites were "The Hitler Dilemma" (could you save Hitler's life if the alternative was worse?) and "I Love Her From the Mirror" (a man "accidentally" spies on his neighbour through a one-way mirror), with "Tamagotchi" and "The Tuscon Time-Traveler" as close seconds, but they all tickled my fancy in some way or the other. Some of them seemed to end a bit abruptly (which is so often the case with short stories), but I appreciated that others were given enough page-time to really explore the premise of the story. I almost wish I'd saved reading this for the readathon... Being short, approachable and engaging it would have made for the perfect readathon material.